We have already looked into what is important to know about your soil to be able to manage your vegetable garden. When you have missed the blog check it out here. The 'Type of Soil' test is based on a very simple principle. 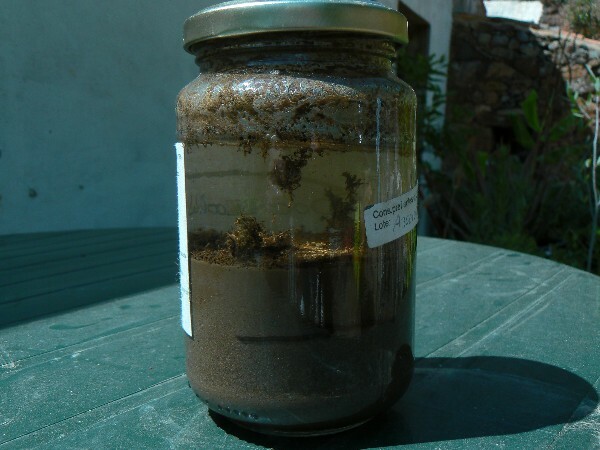 You add soil and water to a jar and shake it. Sand particles are course and heavy so they will sink to the bottom of the jar first. Silt particles are less course and heavy, they will sink less fast and settle down on top of the sand. Clay particles are tiny and light, they will float around in the water quite a while. Finally after hours they will settle down on top of the silt. You can do this test as a stand alone, but I prefer to do the 'type of soil' test and a pH/NPK test at the same time. This way I only need to take the sample from the garden one time. I just make sure you have enough soil for both tests. Hide Analysing the soil from your vegetable garden. Report Analysing the soil from your vegetable garden.